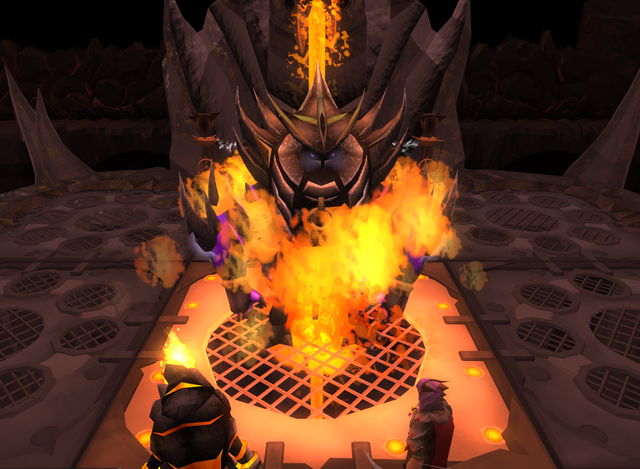 The Brink of ExtinctionÂ is aÂ GrandmasterÂ level quest that concludes the TzHaar storyline. It is considered to be one of the most challenging quests in all ofÂ RuneScape, with extremely difficult combat and skill requirements matching the highest in the game. Speak toÂ TzHaar-Mej-AkÂ orÂ TzHaar-Mej-JehÂ in the main plaza ofÂ TzHaar City. They will inform you that the TzHaar race is dying, because onlyÂ Ga'al, which do not inherit the memories of their ancestors, are hatching from the eggs. Mej-Ak and Mej-Jeh wish you to take more Ga'al to theElder KilnÂ to infuse them with the memories held in a dead TzHaar'sÂ TokKul, as you did before withGa'al-Xox. Specifically, they wish you to resurrect some of the greatest champions in TzHaar history so that they can live again. While understanding your reluctance to do it in regards to Xox's torture, they will ask you to do it anyway, for the Ga'al are just abominations and the TzHaar is on the brink of extinction. Mej-Ak suggestsÂ TzHaar-Mej-Gek, one of the wisest and most powerful magicians in TzHaar history, and Mej-Jeh suggestsÂ TzHaar-Ket-TegÂ andÂ TzHaar-Xil-Kal, excellent guard and hunter and formidable in theÂ Fight Pits. They give you aÂ communication orbÂ to find the TokKul of the three named champions, and ask you to also round up three Ga'al wandering around the city and send them to the main plaza. TokHaar-Hok has no weakness, but players are advised to use melee and/or magic during this battle, as ranged armour is weak to his melee attacks as well as those of the TokHaar monsters he summons. Ice spells will keep him stunned through the fight however, so consider these. A melee weapon, particularly a crush weapon like thesaradomin swordÂ orÂ chaotic maul, is best for defeating the TokHaar-Tok-Xil that spawns, which is able to deal rapid damage with its ranged attacks. With regards to equipment, bring the best you have available for your combat style(s). Players may prefer using a two-handed weapon, such as aÂ godswordÂ orÂ staff, over aÂ shield, but a shield will help players who have difficulty surviving the battle. Consider a crush melee setup until the Xil is dead, then switch to an ice mage setup for the rest of the fight. At the beginning of the fight, you will only have to deal with TokHaar-Hok. Ga'al-Xox will also fight, attacking TokHaar-Hok with ranged, but he will not deal very much damage throughout the fight. Keep an eye on the floor to ensure that you don't stand on a section that is heating up, and be careful not to accidentally attack any other monsters with a stunning ability, or TokHaar-Hok may heal himself. Before long, TokHaar-Hok will summon a level 184Â TokHaar-Tok-Xil, which will attack you with Ranged.Â This monster should be defeated quickly, as its consistent hits of 1000 or more damage can easily stack up over a short time. If the first TokHaar-Tok-Xil is left alive, TokHarr-Hok will summon more of them (up to four, depending how long you leave them alive), resulting in a very heavy drain on food and extraordinary difficulty in finishing the battle. Acrush melee weaponÂ is best, though any melee weapon will do. If you have no choice but to use mage, stand directly beside it, which will force it to use melee attacks too, thus lowering his damage dealt to you.Â Do not attempt to change to the protect from range/deflect range curseÂ as TokHaar-Hok will consistently hitÂ 6,000 to 7,000Â or higher. After you've killed the TokHaar-Tok-Xil, TokKaar-Hok will eventually begin summoning level 180TokHaar-Ket ChampionsÂ as well, but these should be ignored, as their melee attacks are weakened by your prayer. They can, however, drain your prayer, so keep an eye on your prayer points and restore them as necessary.